In omental torsion, the omentum twists around a pivotal point, usually in a clockwise direction (see the image below). Venous return is compromised, and the distal omentum becomes congested and edematous. Resultant hemorrhagic extravasation creates a characteristic serosanguineous fluid in the peritoneal cavity. Example of primary torsion of omentum. Normal-appearing omentum can be seen above torsion point. 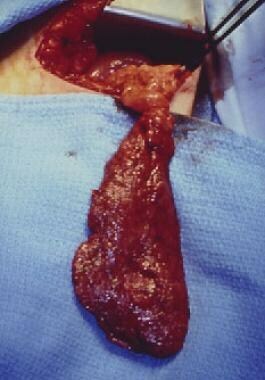 Omentum below that point is edematous and congested. As the torsion progresses, arterial occlusion leads to acute hemorrhagic infarction, and eventual necrosis of the omentum occurs. Spontaneous derotation may be possible and may explain omental adhesions in the right lower quadrant, which are often found during laparotomy and have no clear cause. Factors that predispose a patient to torsion include anatomic variations of the omentum itself, such as accessory omentum, bifid omentum, irregular accumulations of omental fat (in patients who are obese), and narrowed omentum pedicle. Any redundancy of omental veins may lead to kinking and twisting around the shorter and tenser arteries. The higher incidence of torsion on the right side of the omentum is related to the greater size and mobility of that side. Precipitating factors are those causing displacement of the omentum, including trauma, violent exercise, and hyperperistalsis with resultant increased passive movement of the omentum. Cremonini C, Bertolucci A, Tartaglia D, Menonna F, Galatioto C, Chiarugi M. Acute abdomen caused by greater omentum torsion: A case report and review of the literature. Ulus Travma Acil Cerrahi Derg. 2016 Jul. 22 (4):391-4. [Medline]. Beattie GC, Irwin ST. Torsion of an omental lipoma presenting as an emergency. Int J Clin Pract Suppl. 2005 Apr. 130-1. [Medline]. Young TH, Lee HS, Tang HS. Primary torsion of the greater omentum. Int Surg. 2004 Apr-Jun. 89(2):72-5. [Medline]. Zager JS, Gadaleta D, De Noto G. Primary omental torsion in adults: a small series of cases. Contemp Surg. 1999. 55(5):261-63. Reurings JC, Heikens JT, Roukema JA. [Primary torsion of the omentum majus]. Ned Tijdschr Geneeskd. 2011. 155(44):A3776. [Medline]. Occhionorelli S, Zese M, Cappellari L, Stano R, Vasquez G. Acute Abdomen due to Primary Omental Torsion and Infarction. Case Rep Surg. 2014. 2014:208382. [Medline]. Mistry KA, Iyer D. Torsion of the greater omentum secondary to omental lymphangioma in a child: a case report. Pol J Radiol. 2015. 80:111-4. [Medline]. Kayan M, Sabuncuoglu MZ, Çetin M, Çetin R, Benzin MF, Benzin S, et al. Omental torsion with left-sided inguinal hernia: a rare preoperative diagnosis. Clin Imaging. 2013 Jan-Feb. 37(1):173-5. [Medline]. Efthimiou M, Kouritas VK, Fafoulakis F, et al. Primary omental torsion: report of two cases. Surg Today. 2009. 39(1):64-7. [Medline]. Jeon YS, Lee JW, Cho SG. Is it from the mesentery or the omentum? MDCT features of various pathologic conditions in intraperitoneal fat planes. Surg Radiol Anat. 2009 Jan. 31(1):3-11. [Medline]. Tandon AA, Lim KS. Torsion of the greater omentum: A rare preoperative diagnosis. Indian J Radiol Imaging. 2010 Nov. 20(4):294-6. [Medline]. [Full Text]. Peirce C, Martin ST, Hyland JM. The use of minimally invasive surgery in the management of idiopathic omental torsion: The diagnostic and therapeutic role of laparoscopy. Int J Surg Case Rep. 2011. 2(6):125-7. [Medline]. [Full Text]. Sasmal PK, Tantia O, Patle N, Khanna S. Omental torsion and infarction: a diagnostic dilemma and its laparoscopic management. J Laparoendosc Adv Surg Tech A. 2010 Apr. 20(3):225-9. [Medline]. Costi R, Cecchini S, Randone B, et al. Laparoscopic diagnosis and treatment of primary torsion of the greater omentum. Surg Laparosc Endosc Percutan Tech. 2008 Feb. 18(1):102-5. [Medline]. Abe T, Kajiyama K, Harimoto N, Gion T, Nagaie T. Laparoscopic omentectomy for preoperative diagnosis of torsion of the greater omentum. Int J Surg Case Rep. 2012. 3(3):100-2. [Medline]. [Full Text]. Itenberg E, Mariadason J, Khersonsky J, Wallack M. Modern management of omental torsion and omental infarction: a surgeon's perspective. J Surg Educ. 2010 Jan-Feb. 67(1):44-7. [Medline]. Yu JS, Lee WS, Kim YH. Primary Torsion of Lesser Omentum Presented with Acute Abdomen and Successfully Managed with Laparoscopic Surgery. Chin Med J (Engl). 2016 Jul 5. 129 (13):1625-6. [Medline]. [Full Text].